It's that time of year where Scentsy is transitioning from Spring and Summer products, to Fall and Winter. In order to make room for the new items, they have a sale in August where almost everything is 10% off. 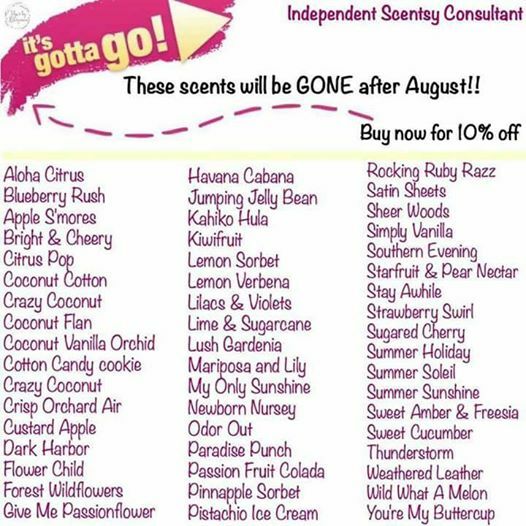 The scents listed above will be discontinued at the end of this month, and are also included in the sale. Combine and save bundles are also discounted. If you're interested in ordering, my link is here: www.deidrec.scentsy.ca and you can shop from Canada, or the USA. Also, as a heads up, all of the prices will be increasing in September. Right now, one single bar is $5 US/$6 Canadian, and they will be going up to $6 US/$8 Canadian. So now is the time to stock up! 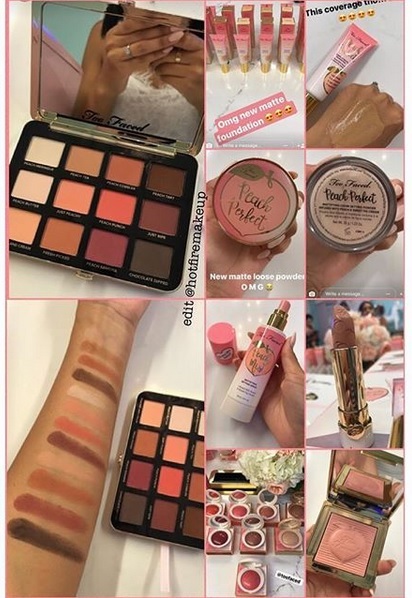 Have you seen all of the new products Too Faced is releasing in the Sweet Peach line?! It looks like they are releasing a matte eyeshadow palette, a matte foundation, setting powder, primer, setting spray, and so much more. It will be released at Sephora on August 31st, which is quickly approaching! I'm sure I will order a few items, although I don't need them! I had another job interview this past Wednesday. It was for a logistics company, doing data entry. I felt it went well, and she told me I would find out either the end of this week, or next week. It looks like it will be next week, as we're already in the afternoon of Friday. The only thing that kind of stinks is that it's far by bus. An hour. I'm not looking forward to that, but it's only a 15 minute car ride (not in traffic) and up to half an hour (in traffic) ... so taking an hour in a bus is not something I'd like to do. If I were to get the job, hopefully I could make enough that I could get my own car, or use a family members. We'll see what happens! But the job search continues. My family and I live in a townhouse complex, we've actually been in the same house for 22 years! This summer the corporation decided they wanted to redo the backyard fencing for the houses, and ours was included. They also decided to extend our backyards, so we gained an extra 5 feet or something like that. Unfortunately, we lost our lilac tree. 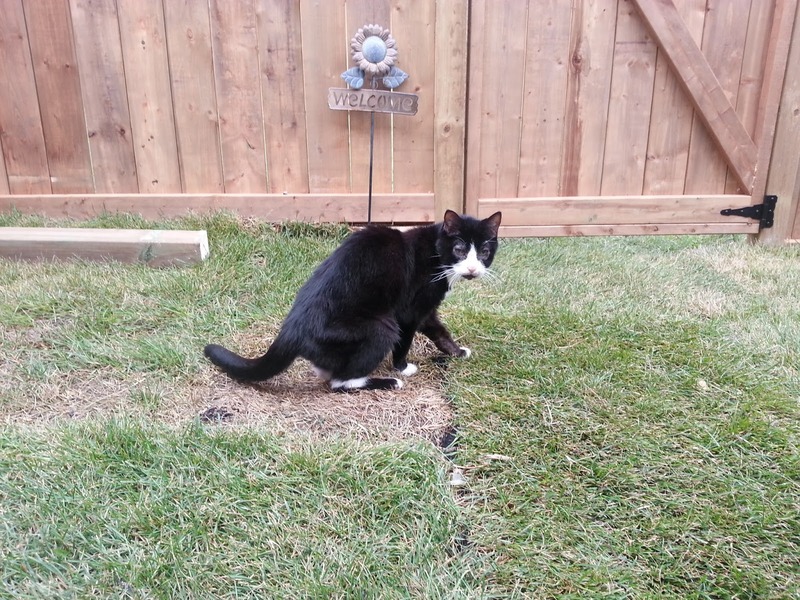 But, we got some added grassy area. Previously it was all patio stones. My animals are so happy. My dog, and my cat, cannot get enough of being out there. It makes me happy because my cat is around 18 years old. And if this keeps him happy in his last phase of life, that's all I want! We put down some sod, and the other half of the backyard is soil and grass seed because there was already some grass there. I can't wait to see it all healthy and growing. We're getting some nasty weather today! Lots of thunderstorms, and some areas even have tornado watches/warnings. If you're in Ontario, I hope you're staying safe! And on that note, my dog just came into the room to hide under the desk!